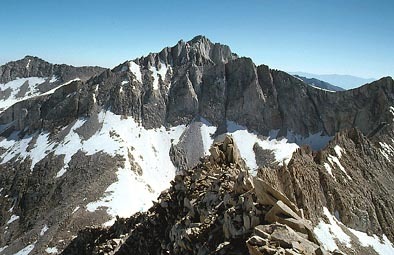 I had signed up for a SPS trip to do this peak, a few years earlier, to hear about a start time of 3 a.m.(?) I cancelled, not knowing if a mistake had been made. It was standard, then, for a SPS group to climb all three listed peaks, Mt. Julius Caesar, Merriam, and Royce Peaks, in one weekend, so an early start was required. Choosing to take a more leisurely angle, and make two activities, our group of four left town Friday after work, to regroup at the Pine Creek Trailhead down Highway 395. One starts hiking up on rough 4WD road, built for a mine higher on the mountain. The big, nearby tungsten mine, when they were operating, put out a mild chemical smell, breathed then for the first thousand feet of gain. One gets higher, and the smell and sight of the mine disappeared, thankfully. It is more then a drudge climb up to the alpine country, reached above ten thousand feet elevation. Up there, it is nice. We settled for a camp near Honeymoon Lake. This was an easy peak for me, since the summit is just several hundred feet up off the trail at Italy Pass, with only class 1 or 2 boulder-hopping needed. We spread out our gear, had our dinner, socialized, and waited for the next day. We awoke Sunday and started early, since one of us was to be predictably slow. We crossed a creek right off the bat. Then, normally, a good trail leads to the pass. 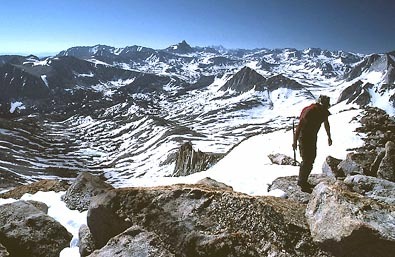 We were met by miles of snow covering most of Granite Park, a large sloping basin of typical Sierra rock. And, the snow was heavily sun-cupped! Deciding to give it a try anyway, we hopped carefully, trying not to slip. Once, while skiing, my ribs went into a raised cup. While I wasn't hurt, someone else could have a severe injury. We plodded on, trying to connect on snow-free sections. Heading more directly for the peak, again since there wasn't an open trail, we finally reached solid granite to climb over. Our slow climber was left a ways behind to plod on as he pleased. We thus had a long stay on the summit. The views were clear. Finally, our slow man reached the top. We read the register, which had an entry from a group of about a hundred Scouts. This is technically one of the easiest 13,000 foot peaks. I shot photos of the view, with a great angle toward Bear Creek Spire (photo below). 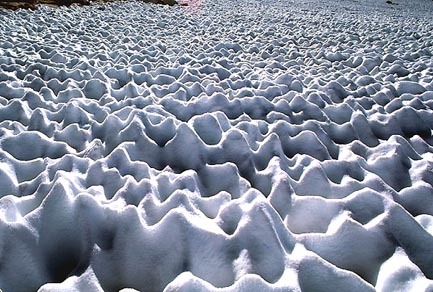 We returned back by Italy Pass, and headed, once again, down the sun-cupped snow. Going downhill, and with breaks from the waiting, it went much better. I had done so much climbing in two day weekends then, I wasn't worried about the time. Getting back to camp, we soon headed down the trail. I waited and waited for our slow climber, then gave up and waited at the cars. He arrived an hour later, stating to having gotten lost, despite the trail, old mining road, and signs. Some persons have to be guided at every moment! It is so relaxing, the main upside, to have completed a climb with lots of rests and waiting. The 300 mile drive home is more tolerable, knowing you are the strong man in the group. This was the last big peak for this slow climber, who has effectively retired. I took him as a favor, since he has been on friendly enough terms. Other climbing groups ruthlessly prune out such people. Now, my style is more that I have the time, if you have the energy. The total stats this weekend was about 6,100 feet gain over some 18 miles round trip.